The subtle shapes and simple colors of the Skyros Corricoware Collection allow the food to come to the forefront as the true work of art, yet with a closer look one can easily see the fine artistry and skill that makes these pieces both sturdy and fine. Made in Portugal, each piece is finished with a subtle hand-painted patina edge. Every piece is freezer, oven, microwave, and dishwasher safe. 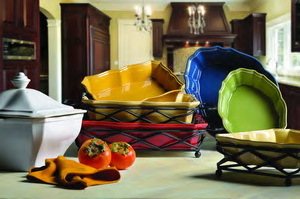 Capture your own unique style with the beauty, versatility and durability of Skyros Designs Corricoware Dinnerware and Bakeware Collection. Skyros Corricoware comes in eight attractive colors: mustard yellow, green, chamomile, blue, paprika, buttercream, celadon and antique white. Some of these colors are as bold and bright as the Portuguese sun and sky, while others are as subtle and soft as one of Portugal's fine wines. Set a table that will reflect your mood as well as your good taste with these outstanding designs and colors from Skyros Corricoware.